It’s been a good summer thus far, despite the fact that my wife had her gallbladder removed following a second visit to the ER in two weeks. While she’s doing phenomenally well, and is recovering nicely, it forced us to be a little low key for a few weeks. When I wasn’t working, we spent our nights and weekends bingeing Netflix series. Even now, two weeks out of the surgery, she’s getting out of the house a bit more, but we’re still keeping things quiet. And I must say that I’ve enjoyed the summer because of it. It’s allowing us to enjoy the little things. As much as we used to sit and binge TV shows periodically, I truly enjoyed the experience this time. Even our outings are small scale, but fun. This past weekend, we opted to do a stay-cation. We headed off to Place 1604 in Dieppe, a whopping 2 minute drive from our house. 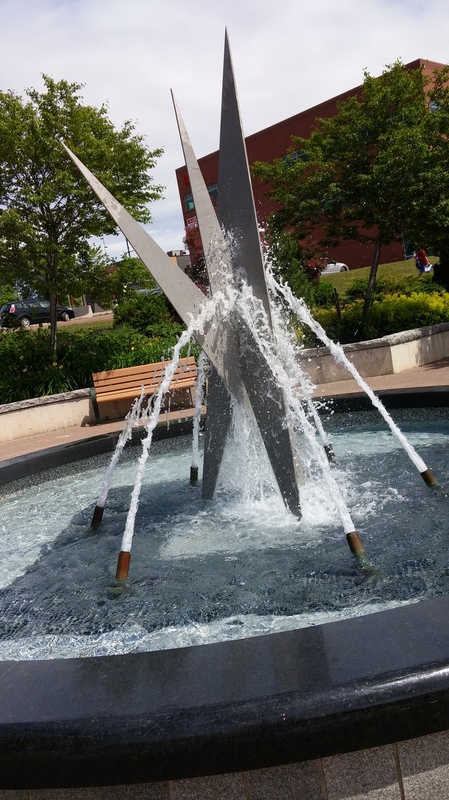 We hadn’t yet been to see the new sculpture unveiled on Canada Day, so we strolled through the property, soaking in the beauty that is our city centre. 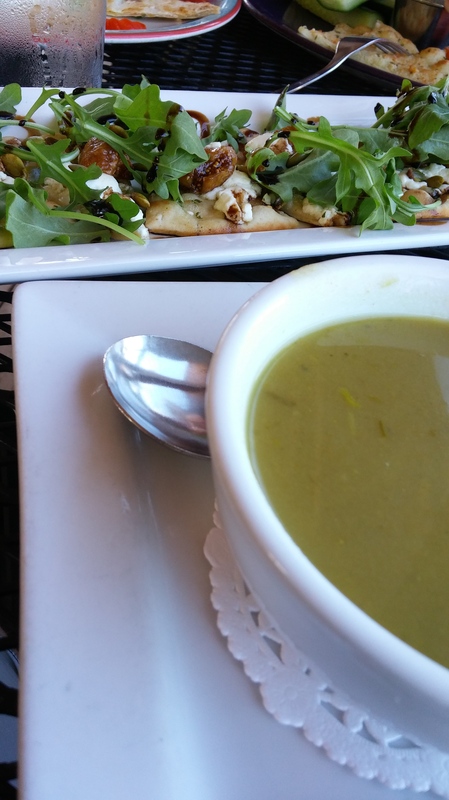 Then we crossed the street and headed to Café Archibald for lunch. As it was such a beautiful day, we lucked out and got the last free table on the patio. Lunch was delicious as always. Over the last few visits, I’ve had the same menu item and it has quickly become one of my favourites in town. Flatbread topped with goat cheese, figs and balsamic reduction. So. Good. I opted to have some dessert as well and went for the dessert of the week – a Nanaimo Bar crêpe. They’ve had the same dessert a few times in the past. 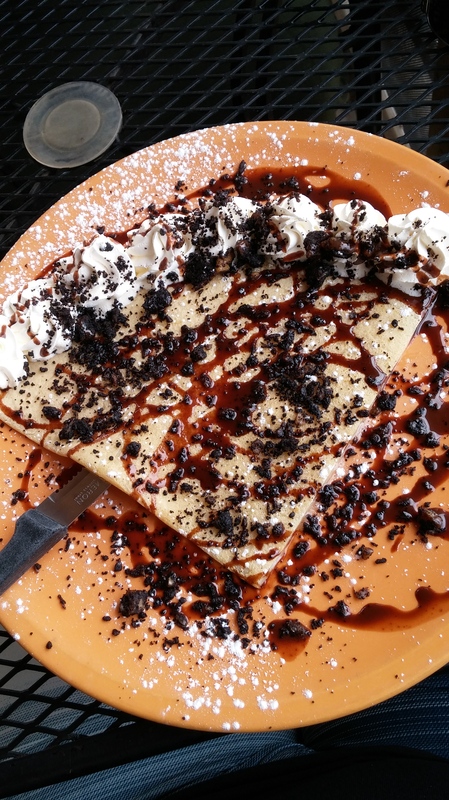 We had the privilege of having it when they first made it a few years ago and it had actual chunks of Nanaimo bar in the crêpe. It was to die for. While this version didn’t have pieced of Nanaimo bar in it, it did have the right flavour profile. Not as good as the original, but tasty nonetheless. Following lunch, we did a bit of touristy browsing of local boutiques. We stopped by Carte Blanche, Maddie & Sofia, and Gifts Galore. We also did the rounds of some of the spiritual/New Age shops in town – Boutique Mystral, Mystic Moons and Le Passage. While at Le Passage, I made a couple of purchases. I’ve long had an obsession with ancient Egypt. I’ve been fascinated by pyramids since I was a child. 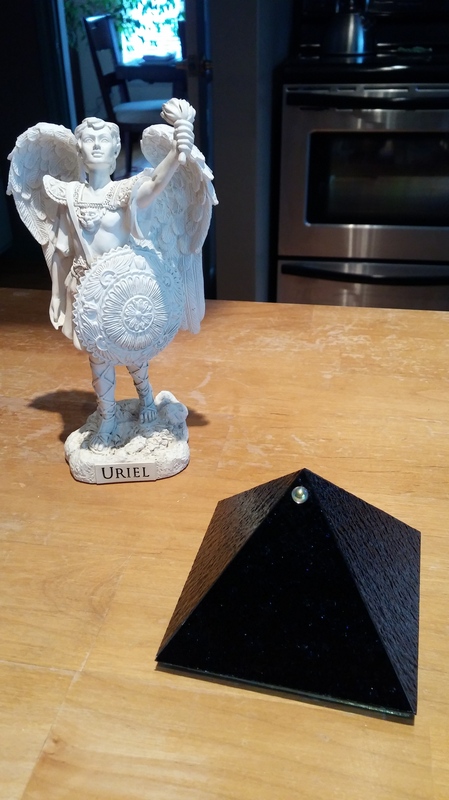 So I opted to buy a beautiful dark blue energy pyramid. Over the past year or two, I’ve also become interested in learning more about Archangels. The one that I’ve “connected” with (for lack of better terms) is Uriel. Lo and behold, they had a beautiful 8-inch statue. Two more fine additions to our meditation room. 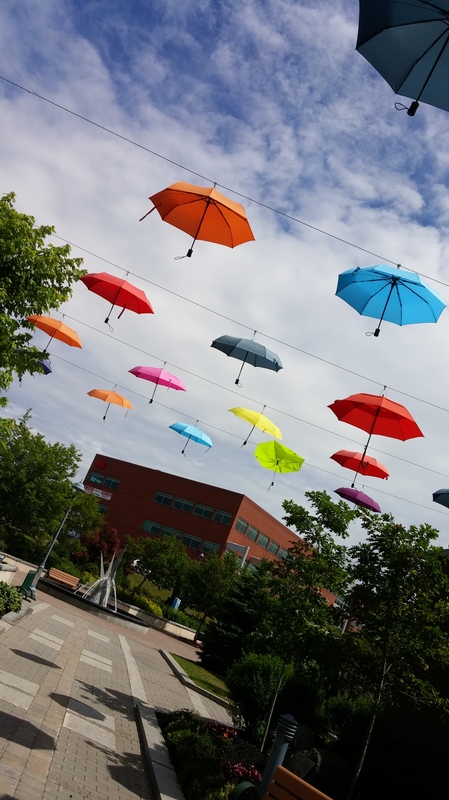 Once we arrived in downtown Moncton, we took a little stroll through Festival Inspire. They had set up a little space along Downing Street with kiosks, vendors and a stage for some musical performances. One of the big pieces of the festival is the creation of murals around the city. This was the main reason we headed downtown, so we could see the turtle. 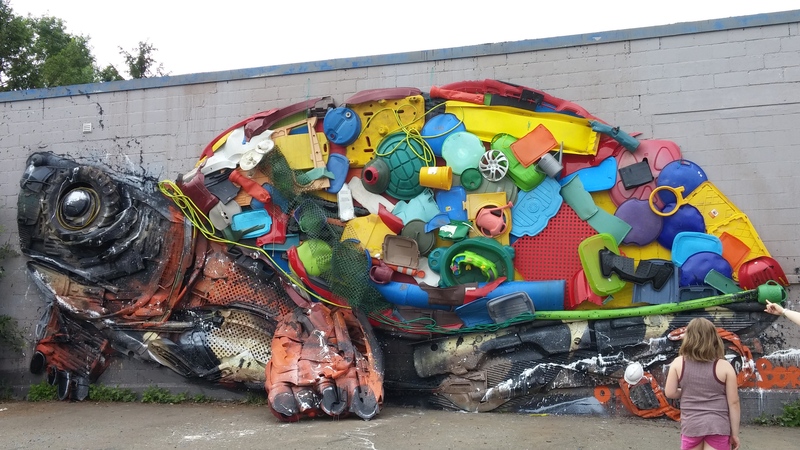 The turtle was created by an artist based out of Portugal named Bordalo II, using pieces of plastic garbage from around the city and from the recycle centre. It’s a stunning piece to see in person, emerging in three-dimensions from the side of the building. All in all, a beautiful day! I enjoyed strolling around the city enjoying things that we don’t usually take the time to appreciate. You have to enjoy the little moments in life. They are what make up the bulk of your life. 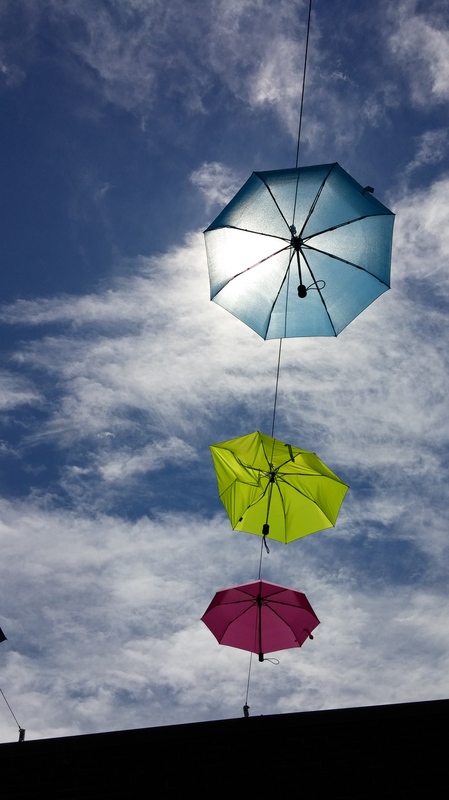 Soak them all up and live your life to the fullest.